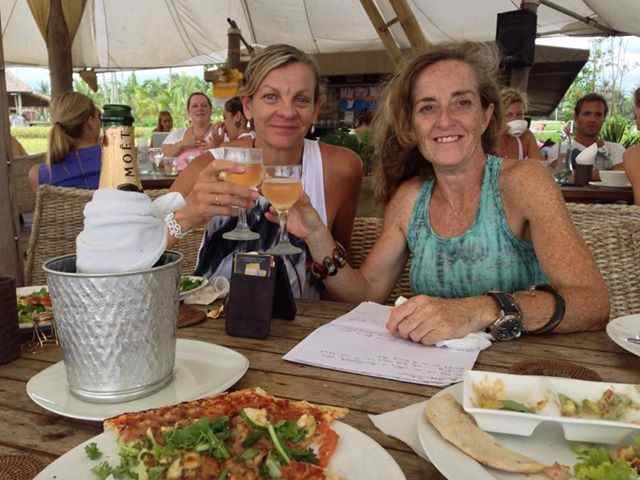 After a glass or two of Moet I decide it’s a good time to “interview” Jo Sharp aka Sharp Moves Fitness about how Bali brought us together to become partners in retreats and the best of friends. First I need to set the scene for what has become known as our “Moet Moments”… an open-sided tent structure overlooking the rice paddies, hot tropical weather, chilled Moet (wrapped in cold towels and transported via pushbike), pita bread, dips & wafer thin pizza. It’s our time to relax and reflect after wrapping up another Body Transformers Retreat. Jo: I think we need to start the story before Sharing Bali…. let’s zip back to around 8 years ago when I was in Ubud with my husband and daughter. I didn’t want to go to the Monkey Forest so I headed off to a warung I had spotted up the hill. It had cushions and delicious fruit juices. I had an hour to myself there, taking in the amazing Ubud atmosphere. Little did I know that the person scurrying around, the ex-waitress from Bateman’s Bay, I would meet a few years later at Sharing Bali. Karen: There was only one place near the Monkey Forest in those days that had a cushion filled restaurant overlooking the rice paddies and Monkey Forest. 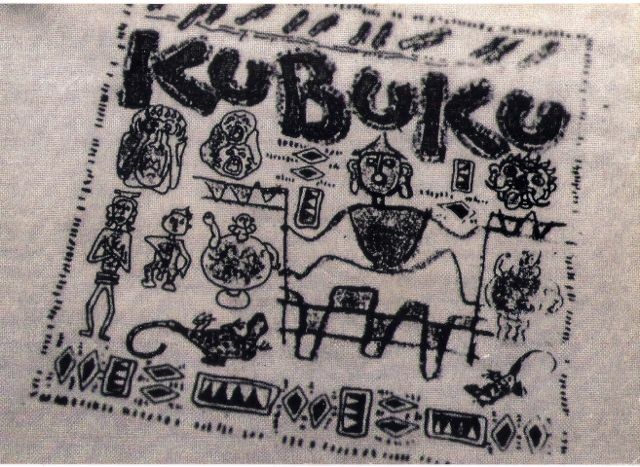 It had to be “Kubuku”, owned by my partner Wayan. Fate at work! 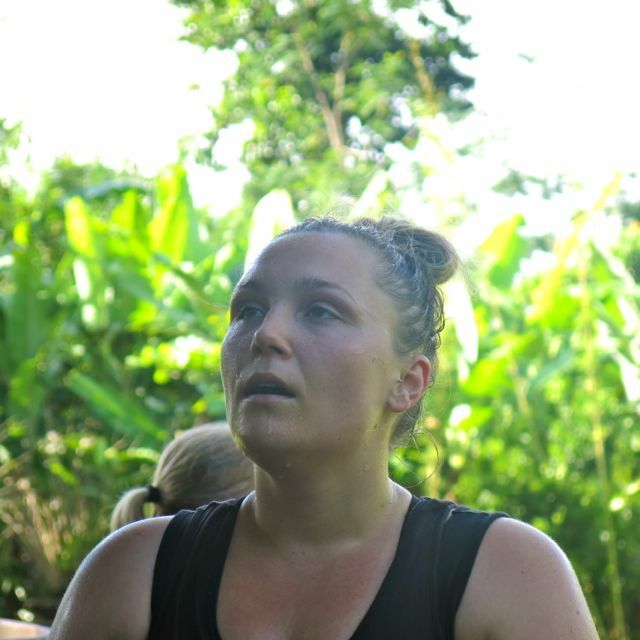 Jo: Fast forward 4 years later and I wanted to start up my own Bali Bootcamp. I thought it was a great name, but decided to Google it to make sure no one else had done it and who did I find? Sharing Bali. I was staying in our van at our South Coast haven at the time, sending frantic messages to you about whether I should join a retreat asap. My daughter was doing HSC at the time so it was tricky timing. I jumped on a plane 2 weeks later, landed in Sharing Bali and found my new Bali home. Karen: 16 retreats later we are going strong. I love that we always think about fresh ideas for our retreats. 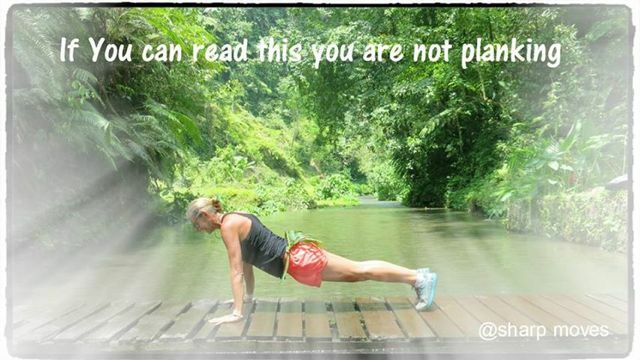 What inspires you when you are planning your Bali workouts? Are there some favourite Sharp Moves? Jo: With Sharp Moves the aim is always to have fun. Everyone takes life far too seriously, especially regarding fitness. Books, programs, calorie counts, diets, heart monitors are all good but in my Sharp Moves world at Sharing Bali its about having fun, just being active and by reuniting with the child within you, you are going to get a good workout without really knowing it. Karen: Tell me some of your best, or most unexpected outcomes from the Body Transformers Retreats. Jo: The special moments are when guests have that “lightbulb moment” and start to believe in themselves. They do much more than they thought possible on retreat, then go on to maintain their fitness once they leave us. Also the connections made amongst our guests are what I love to see. 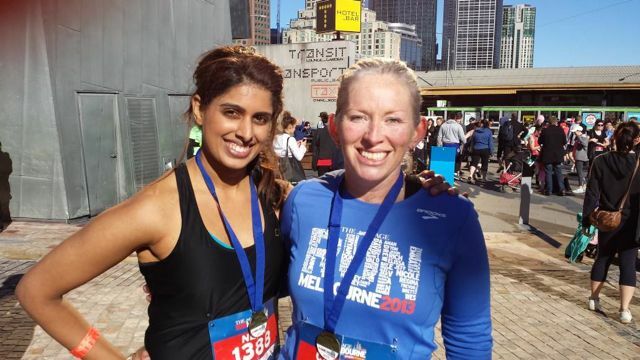 People who meet on retreat reconnect back in their real life, often doing races and events together. When I first started I wasn’t expecting that people would feel so attached, but now I know that everyone feels like they are part of the “Bali Crew” family. Karen: I know that prior to booking most guests are concerned about “being fit enough” for the retreat. It must be hard to plan your sessions when you only get to meet your clients for the first time in Bali. It’s inevitable that there will be differing fitness levels and personal goals amongst the group. You have their medical/fitness backgrounds, but how do you manage this? Jo: I see that as my problem, not the guests’ problem. My aim is to ensure everyone has a good workout and it just comes with experience knowing how far you can push people. I prepare plans but can change quickly once I read people. The Pilates sessions we do on the first afternoon of the retreat gives me a good insight into injuries, technique, strengths or weaknesses. It’s easy in Bali to get the vibe of what everyone is looking for and make it work. Karen: How do you keep it fresh? We all know we have to do squats, pushups, burpees. But really? Everyday? Jo: Being an ADD type trainer (I have the attention span of a flea) I’m the same as the client and can get bored with the same routines. I like to keep changing and adding layers to my fitness sessions. I do a lot of research and always try out new ideas. 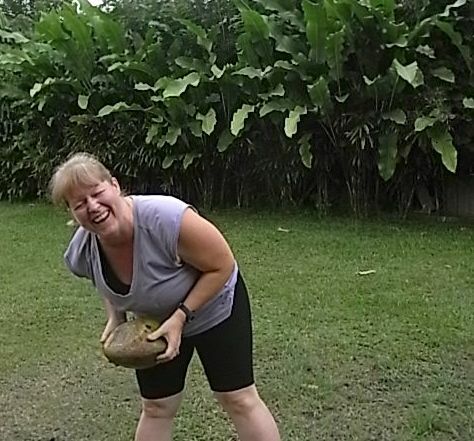 By adding bamboo, coconuts, a work out in the river you get the same workout, but I’m changing the environment and the equipment. 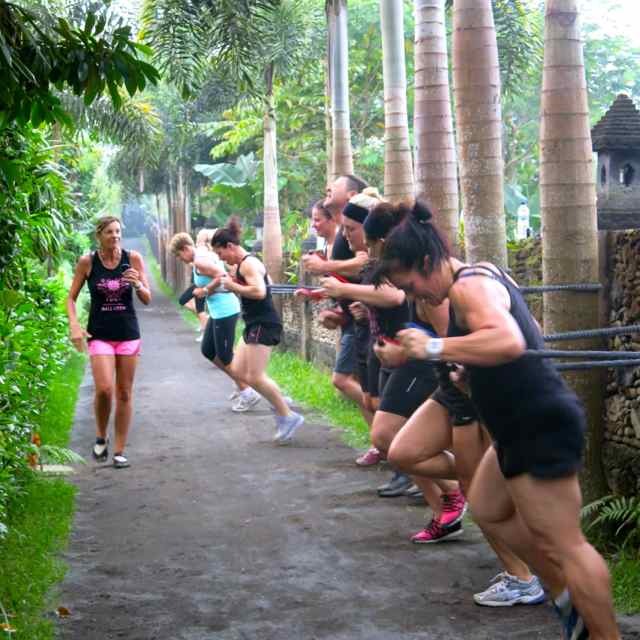 Karen: The highlight for you in the Bali fitness sessions? Jo: I really like the “surprise sessions” where guests are happily walking along in the rice paddies, thinking, “this is our day’s activity, I can do this” and then I pull something out that takes them by surprise. It might be a workout in the middle of the river with resistance bands, or on the bike ride I spot a pile of coconut logs that make ideal weights, or we stop at a set of stairs. It’s the “seize the moment” opportunities that I really enjoy. 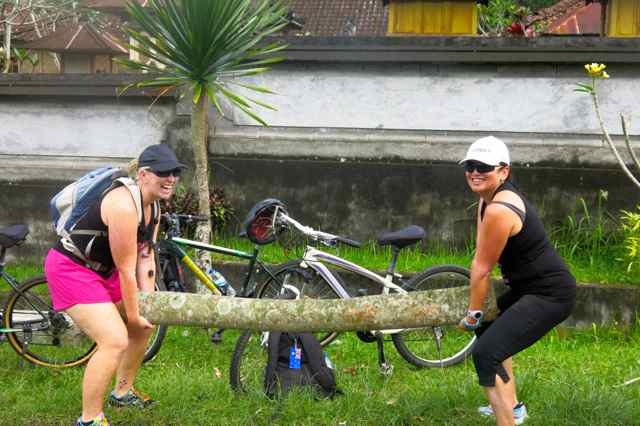 Jo cannot cycle past a pile of coconut logs – perfect weights opp! Karen: After Bali, what’s it like to return to Sydney? Do you find yourself looking for coconuts in your own home gym? Jo: My home gym is interesting. I don’t have coconuts but I have sandbags, and I make a lot of my own equipment. 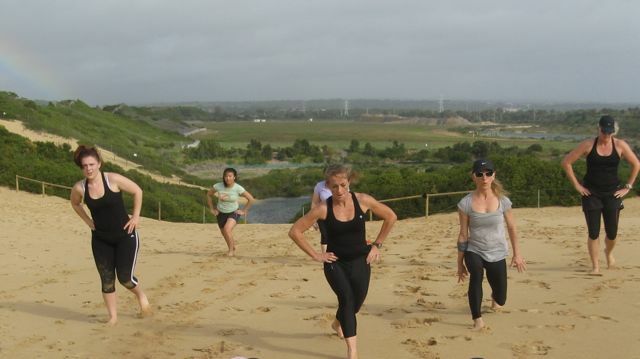 I do train very similar to how we train in Bali. We go for a run, I tie things on to trees, I’ve got sand, but it is a little different to Bali because we don’t have the same resources. Having a training style of “seizing the moment” is all about making the best of what is around you. Karen: It sounds like it’s pretty easy for you to train outdoors. Jo: I live in a beautiful area right on the beach, but surrounded by bush. It’s the perfect combination for my workouts. Karen: You are quite famous for your “Sharp Move Challenges”. My most memorable one would have to be the plank challenge… starting off at 10 seconds day 1, adding 10 seconds everyday until we hit 10 mins. I can confess to sore abs and shoulders from that one, but I surprised myself by getting up to a 6 min plank! What’s next? How do we get involved? Jo: Sign up to the Sharp Moves Facebook page for the link to the free online challenges. The next one will probably be a quick one for abs – a six-pack by Christmas is the aim! Then we will repeat the famous New Year Workout. Look out for 2014 reps of a particular exercise in one month. Karen: I can hardly wait for that one! Now, talk to me about “Boo”. I love seeing him in your workout photos. What’s the story? Jo: Boo is the 9-year old Rhodesian Ridgeback CEO of Sharp Moves. She is part of the research team, testing out hills and bush runs. The first time I did a test run on the infamous Cronulla Sandhills, I think Boo lasted about two laps before sitting down to watch me, no doubt thinking I was an idiot. She helps me work out what’s doable. The whole company revolves around Boo. If my exercise equipment is getting too much attention she will chew a few holes into sandbags or may even bury some of it in the garden. Karen: And the name Boo? Jo: Boo came from a favourite family book “To Kill A Mockingbird”. When we first got Boo my daughter was quite young. We gave Boo her name after seeing the movie with Robert Duvall playing Boo Radley, the Protector of Children. Karen: Aside from doing the retreats, you are obviously happy to spend time in Bali. What draws you here? Jo: I fell in love with Bali in the 70’s. I think it’s the culture, the people and I really feel at home, quite at peace. It actually draws me back to living in a realistic world. When I head home to Sydney, especially at this time of the year around Christmas, when I hit the shops it seems to be stressed and about greed, looking out for oneself. The Balinese don’t have a lot, but it’s a simple life and they seem to be happy. It actually grounds me and I’m pretty sure it makes me a better person. Karen: You are certainly well loved in our village. The Sharp Moves School Shoe Drive has made a big difference to the lives of many kids. Jo: It hit a place in my heart when I heard kids couldn’t go to school without school shoes, as the same thing happened to my father – he was too poor to have shoes and so was unable to go to high school and had to repeat primary school until he was old enough to leave school. I just put the word out there amongst my clients and I soon have a collection of used, or sometimes new, school shoes to bring to Bali. Karen: Like myself, you are a bit of a nomad at heart. Sharp Moves has recently been to Italy. I followed your trip via Instagram and would love to know more. 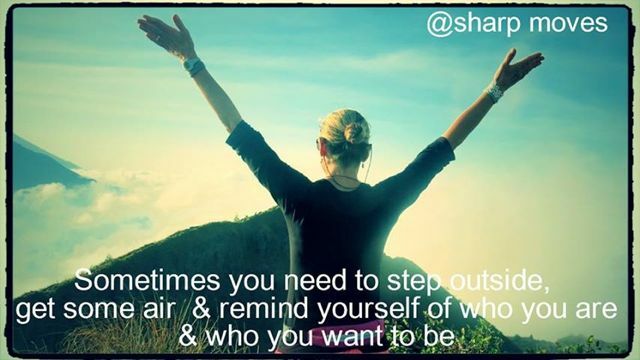 You are back in Sharing Bali in 3 weeks time for another Body Transformers Retreat so lets set up another “Moet Moment” and talk about the Italian version of Sharp Moves. Thanks Catrice, you continue to amaze with your efforts! PS. Looks like I might be able to join you on the Sharp Moves Mt Warning Retreat. I might be due for a visit to Australia at that time!